These park rangers at the Martin Luther King Jr. National Historic Site can work anywhere in the park system that they choose, including the Grand Canyon National Park. Two units of our glorious National Park System give us the opportunity to experience the essence of Dr. Martin Luther King, Jr. as we celebrate his birthday Jan. 21, 2013. In Atlanta, the Martin Luther King, Jr. National Historic Site contains his birth home; the district he grew up in; historic Ebenezer Baptist Church that he preached in; the horse-drawn carriage that brought his body for burial; the Reflecting Pool holding his and Mrs. King’s crypts; the blazing Eternal Flame, and the rose garden which Mrs. King planted to honor her husband. It also includes the Civil Rights Walk of Fame imprinted by the feet of scores of civil rights leaders, anchored by a bronze statue of Mahatma Gandhi, Dr. King’s ally. Inside the historic site, a tableau from the Civil Rights March shows Blacks and whites marching together, including a man on one leg. TVs play some of the most poignant speeches from the Civil Rights struggle, and I am inspired once again to do my best for my country. In Washington, D.C., the Martin Luther King, Jr. National Memorial is the newest monument on the Washington Mall. It was dedicated in 2011 to honor the leader whose “… inspiration broke the boundaries of intolerance and even national borders, as he became a symbol, recognized world-wide, of the quest for civil rights of the citizens of the world…” A “first” in many respects, the monument is the first to honor a person who was not a president, and the first to honor an American of African descent. It is configured in such a way as to tell the story of Dr. King’s life, and park rangers are present from 8 a.m. to 8 p.m. to conduct tours and answer questions. I was amazed to learn that the idea for the monument originated with Dr. King’s fraternity, Alpha Phi Alpha in 1984. Who would have guessed that by the time it was shepherded through Congress, from authorization to completion, the first American President of African descent would have been elected and he’d be the one to dedicate it? These two units commemorating Dr. King’s legacy are among 397 units of the National Park System, which also includes places such as the Grand Canyon National Park; George Washington Carver National Monument which includes his birth home, and Tuskegee Institute National Historic Site which includes his laboratory; Mary McLeod Bethune Council House National Historic Site and the Frederick Douglass National Historic Site. At least 13 other units are officially designated as part of the African American experience, but in our travels through 167 units, we’ve found scores of other parks in the system where Americans of African, Hispanic and Native descent have made vital contributions to our country. By virtue of being in the Park System, every unit has exactly the same priority, and is treated with the same level of care. The staff is held to the same high standards across the country, as they are ambassadors to nearly 300 million national and international travelers who visit the parks each year. The National Park System is supported by our taxes, and is a “best buy” for individuals and families that want to travel and explore our country. For those age 62 and above, $10 buys an America the Beautiful Senior Pass, which allows you and your carload of people to enter every national park unit in the country for the rest of your life!!! If you’re under 62, an $80 Annual Pass gives you the same privilege, and you buy one each year. Active military personnel and the disabled pay nothing at all. 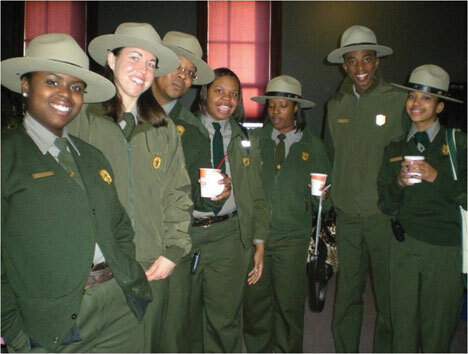 This Black History Month, do something different and discover a unit of the park system! Experience history in the place where it actually happened, and you will feel a new sense of pride and wonder in our country.